Tannoy TS2.10 review | What Hi-Fi? The Tannoy TS2.10 is an extremely capable subwoofer that would complete most price-compatible systems in style. It moves large amounts of air with ease, reproduces fast and lively rhythms with good detail and reaches down to a claimed 24Hz. It certainly explores deeper basslines with confidence, filling the room in compelling fashion with music and films. It lacks a little punch compared with the class leaders, but this shortfall isn’t enough to spoil the overall performance. If you take the grilles off, you’ll see that it’s sporting two side-firing 25cm drivers – one is powered by a 300W Class D, while the other is a passive radiator. The TS2.10 also has variable phase control, which, along with the standard complement of line-level inputs and outputs, is nice to find and makes it easier to integrate with an existing speaker package. The cabinet is built from heavyweight 25mm MDF, and comes in dark grey satin or high-gloss black or white finishes, which are well up to coffee-table standard (although we don’t recommend you use it as one). It’s solidly built too, so nothing rattles when the going gets explosiony. 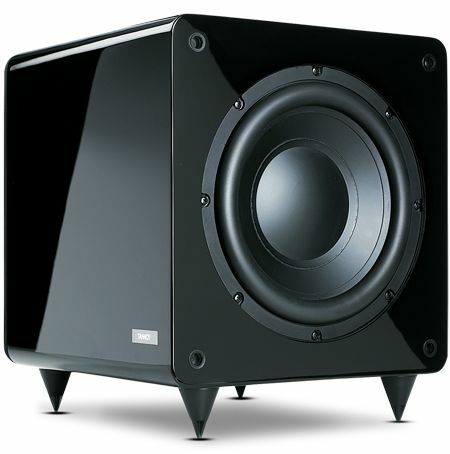 The TS2.10 is a decent subwoofer that delivers dynamic, engaging bass – and at such a reasonable price, you’ll definitely be getting your money’s worth.